My Mum makes a cracking dinner in which she coats chicken breasts in beaten egg and then dips them in Paxo sage and onion stuffing mix and bakes them in the oven. They’re absolutely delicious, but as anyone who follows the low FODMAP diet will tell you, onion can be a massive trigger for a lot of people, me included, so I needed to adapt Mum’s recipe to make a FODMAP friendly version. The dried sage is perfectly FODMAP friendly and the breadcrumb component of the sage and ‘onion’ chicken was easy enough to substitute with some stale low FODMAP gluten-free bread, but the ‘onion’ flavour that’s so characteristic of stuffing mix can be difficult to replicate. However, I’ve written before about the fantastic spice that is asafoetida powder, a powerful spice that’s derived from a variety of giant fennel and is wonderful for using in recipes as an onion substitute. Its flavour truly mimics the depth of onion and it even has a hint of garlic notes to it too, so it’s the ideal low FODMAP solution to add to your recipes. You can buy it here online from Casa de Sante. 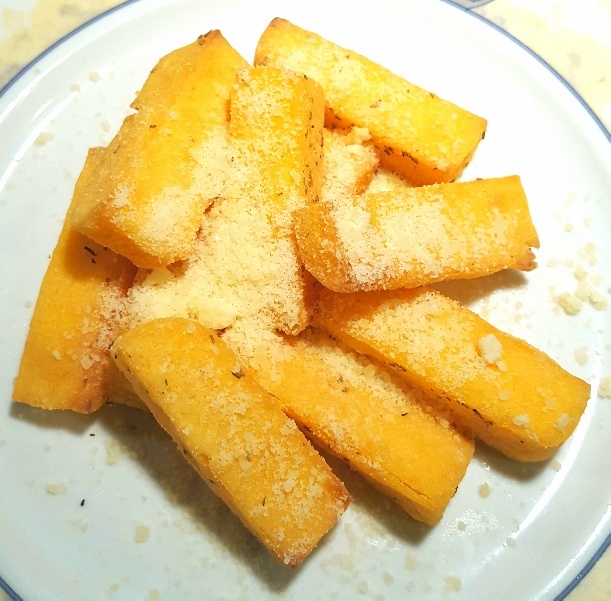 I’d been looking for something to serve alongside the sage and ‘onion’ chicken and although I love chips and homemade potato wedges, I fancied something a bit more exciting to go with it, so when I noticed the pack of ready made polenta in the cupboard I decided to have a go at making my own polenta chips. I’ve tried making my own polenta from scratch before and I’ve never been that impressed with it, but I absolutely adore Jamie Oliver’s polenta chips that he serves in his Italian restaurants, so when I was shopping a while ago I thought I’d buy a pack of ready made polenta and try to have a bash at making polenta chips at home. 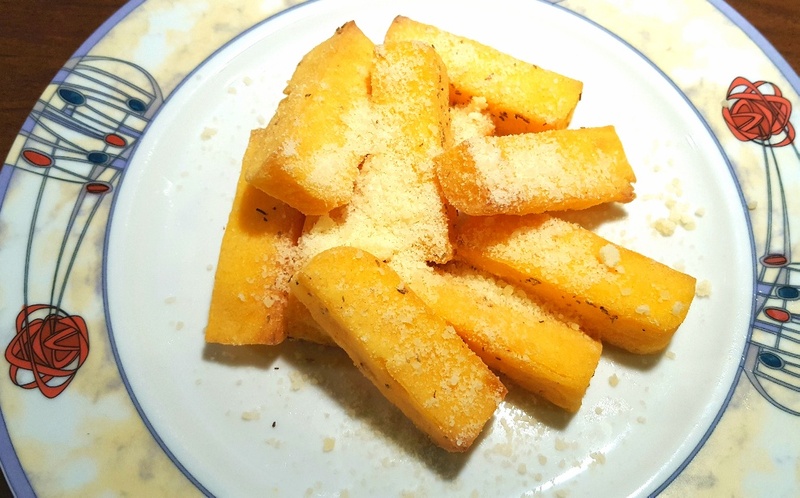 I’ll be honest with you, although these polenta chips are very tasty, it was difficult to get the same results as those you can have at a Jamie Oliver’s Italian because I think you’d need to deep-fry the polenta chips to get the same level of crispiness that his have. Also, I’d think I’d prefer to have a chip that’s made from potato instead of polenta because at least that way I’d be eating the abundance of vitamins and nutrients which are naturally found in potatoes rather than the pretty much pure carbohydrate that is polenta. 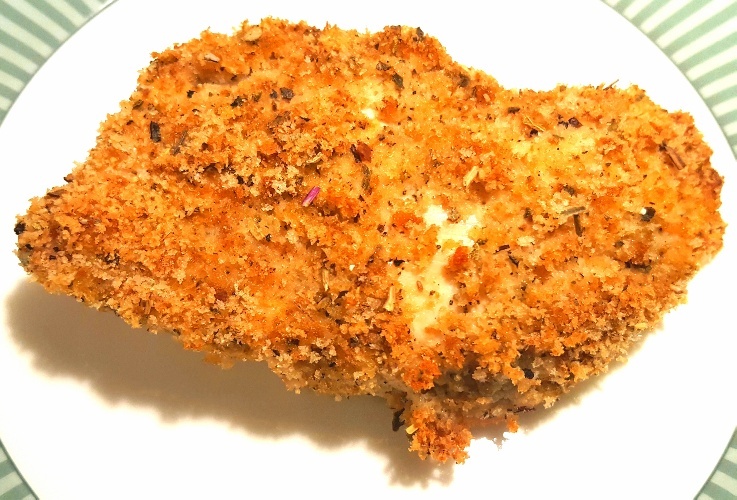 To make the chicken: mix your sage, salt and pepper and asafoetida powder into the breadcrumbs. 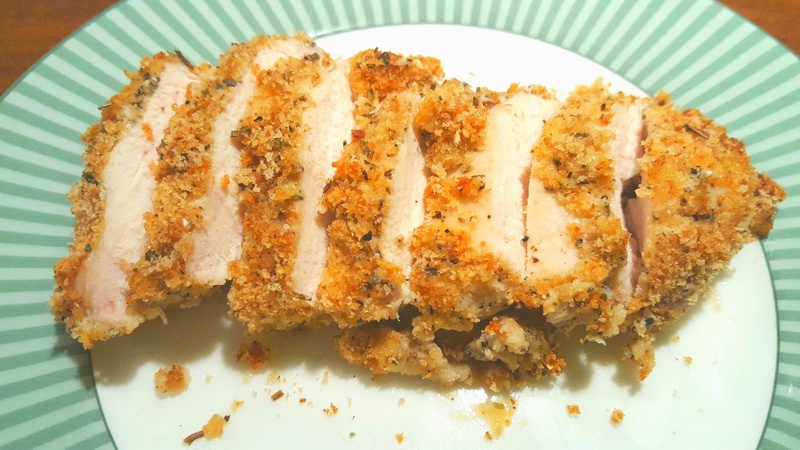 Dip each chicken breast in the beaten egg and then the breadcrumb mixture and lay them on a baking tray. Coat your polenta slices in ground polenta, place on a baking tray, coat with oil and scatter the dried rosemary over the chips. Bake both dishes in the oven for 25-30 mins or until the chicken is fully cooked and your polenta chips are crispy. Sprinkle the polenta chips generously with parmesan and serve with the chicken breasts and a fresh salad.